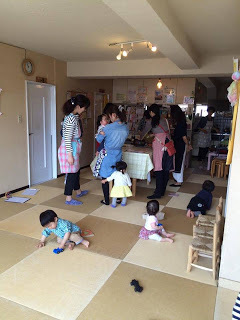 Today I had fun to learn Kodomo-no-hi party recipes with my breastfeeding baby. 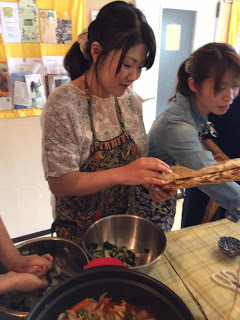 I was excited to know how to make ‘Kashiwa mochi. 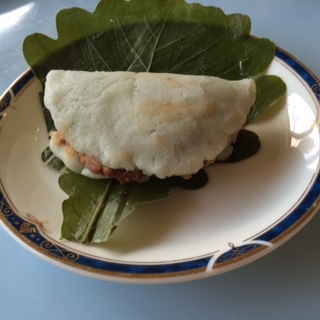 The handmade Kashiwa mochi tastes nicely sweet and very healthy compared to the one from a store. 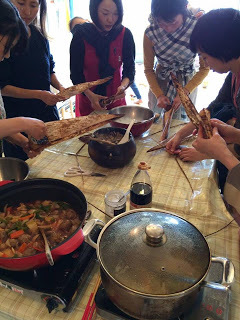 Also, other recipes are not only so delicious but very healthy and easy to make thanks to the kasane-ni cooking. 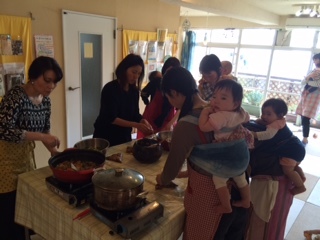 As usual, we participants prepared lunch together, chatting while some kids and babies were playing. 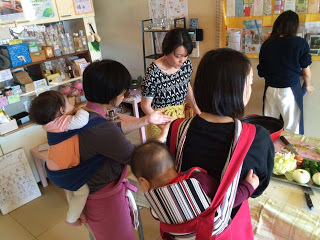 Some moms gave her baby a piggyback (ONBU), others wore her baby in front using a sling(DAKKO). 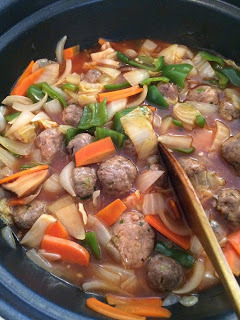 I'll make today's dishes on Kodomo no hi to celebrate the first anniversary of my son. 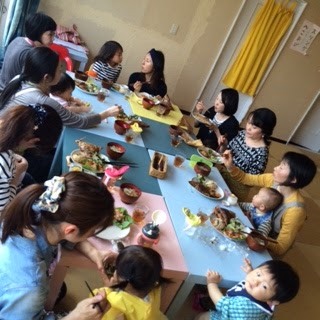 Children’s Day is a national holiday in Japan when people pray for the health and happiness of children. The 5th day of the 5th month was celebrated as the Iris Festival in ancient times when the lunar calendar was used. The Iris Festival, tango-no-sekku in Japanese, marked the beginning of the summer, and people prayed for boys to grow and be healthy. Today, the Boy’s Day Festival is on May 5th. Families that have boys put up carp-shaped streamers made of cloth (koinobori) outside. Samurai dolls in armor are displayed inside to drive away bad spirits and celebrate the future of the children. 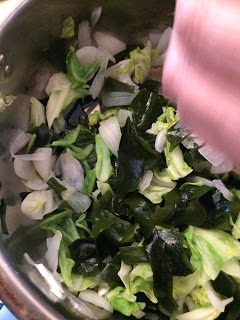 Children take hot baths with iris leaves called shobuyu, and eat kashowa-mochi and chimaki. Carp, samurai, irises, oak trees, and bamboo all symbolize strength and courage. Both of these traits have traditionally been desired, especially for boys.